"No pleasure, no rapture, no exquisite sin greater... than central air." Sure, we've had other excursions over the last few months. #GetOutAndGame with our friends Melinda and Tristan was awesome, as was our summer beach vacation in Delaware. But if I'm ever going to teach my kids how to properly appreciate nature, I need to spend a little more time outside. I just needed the proper motivation. *For those who don't spend their lives in front of computer screen IRL stands for "In Real Life"
Since my regular car was in the shop still, I had access to a brand new Ford Fiesta and the kids wanted to go for a drive. I love tiny cars, not sure why, but I was all for a journey. Opening up Google Maps I looked for a large park that our family never visited. Once I found someplace "special", I settled on an activity that would get the kids really excited. A departure from our regular #GetOutAndGame'ing, we left our dice, maps, and books at home and instead packed up pencils, pens, crayons, markers, and lots of paper. We also grabbed snacks, water, sunscreen, hats, and a soccer ball (just in case). Although my wife visited Twin Lakes Park when she was younger, the rest of the family had never been there. All I knew was that the park had two lakes (obviously), walking trails, fishing, boating, a skate park, a dog park, and several playgrounds. We arrived at the park around 12pm. At first we were a little confused. We found the playground and skatepark, but didn't see any lakes. After wandering around a bit I became quite concerned! I figured that we were on the wrong side of the park, so I made the kids get back in the car and we set out to find the lakes. It turned out that we were in the newer section of the park, and that only a mile away was a second entrance. Once we got there the kids started to freak out with excitement! The view of the lake was gorgeous, and the walking trail was paved. There were many sights along the lakes, and we took our time. Around 12:30 we began our trek around the Twin Lakes. The kids were completely enamored by these physical activity setups all along the trail. Tests of physical strength and stamina are stationed every couple hundred feet. Some required pull-ups or sit-ups, others (featured above) were feats of balance. I managed to scale a grown-up sized set of monkey bars... which I must admit was pretty cool! The walking path at Twin Lakes is broad and well kept. Other walkers were out enjoying the path, as well as runners and bikers. We even ran into a few dogs... and a cat... on a leash. The lower lake has boats that you can rent. All three kids wanted to take a paddle boat tour of the lake, but given their lack in swimming abilities I told them that we would have to wait until another trip. There are several portions of the lake that empty into waterfalls. The water level seemed low, but it was still fun to watch. On the southern end of the lower lake we found a terrific place to set up our "outdoor art studio!" Both a bench and a picnic table lay underneath the shade of several massive trees. I instructed the children to "draw what you see." The view was inspiring, so the kids unleashed their creativity. While the girls took up the bench, Cooper sat with me at the picnic table. I will admit, I started working on a map for an upcoming RPG... so I broke the rules a bit. But I can say that a feature of the map involved water. Cooper insisted on drawing something that he saw during the hike, which was perfectly acceptable. Evie found her inspiration in the boats that were paddling by. Cooper's butterfly! Cooper said that if you look closely at a butterfly's face you can see a smile, so he put it in his picture. Carrie didn't finish her pencil drawing of the lake and surrounding hills, but we took a picture so that she could later. Evie drew our family walking around the park, along with the canoe and paddle boat that we saw. Around 2pm we started back on the trail. We found another waterfall, which was only dribbling but was still peaceful to watch. When we reached the upper lake, Carrie looked out and announced that she felt like we were in the "Legend of Zelda." Carrie's Legend of Zelda conversation continued into the nearby woods. She now wants to purchase a full cosplay outfit so that she can return to Twin Lakes for a photo shoot. I told her that she needs to save up some money first, those costumes are expensive! We finished our walking tour of Twin Lakes around 2:15. It was a great day, and I'm so happy that the children didn't complain once about not having their Kindles. Not to say there wasn't a little complaining, but it was all about who had to hold their water bottles. ... with a trip to Dunkin Donuts for iced coffee and wake-up wraps! There is so much to discover in Western Pennsylvania, and we've only just begun. Over the next few weeks and months we plan to do more of these "IRL Adventures", and will continue to share our tales. 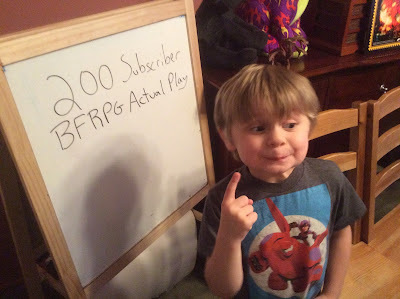 Perhaps we'll include some gaming, or art projects, or cosplay in our upcoming quests. What kind of trips are you taking with your family this summer? What adventures can you recommend to folks on a budget? 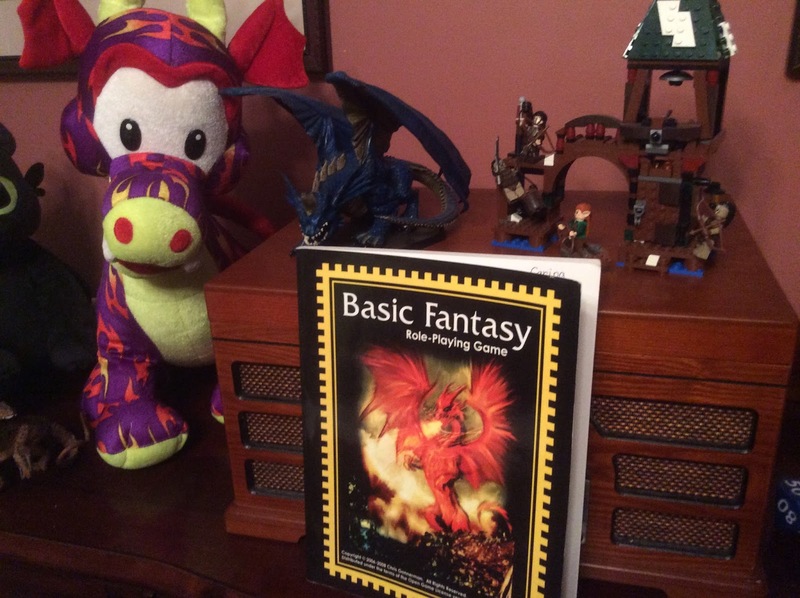 One of my favorite things to do as a game master is plan out the “next great campaign.” My fellow game masters know exactly what I’m talking about: that mythical future gathering that will fulfill all of your gaming fantasies and more! 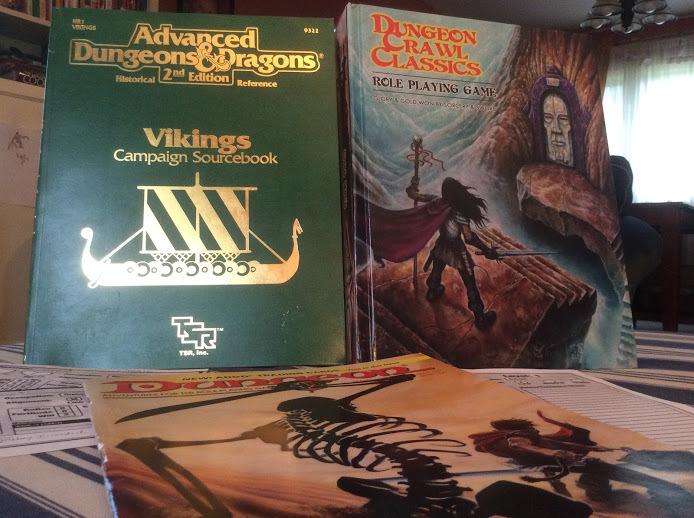 More often than not these incredible ideas pop up right in the middle of an existing campaign, leaving the GM with a tough choice: end the current campaign abruptly or shelve the new idea. Typically I have to place these cool ideas on a backburner for later, as I’ve learned (the hard way) that there is no faster way to burn out players than to churn settings every three to four sessions. Just ask my friends Craig and Frank! Most players want stability, and to watch their characters grow and evolve over time. Given my previous mid-campaign obsessions with “new and improved” ideas, I’ve been baffled by my reaction to recent circumstances. In late May and early June I wrapped up two fairly long-running campaigns. For nearly a year I ran a Numenera campaign on Google Hangouts with characters advancing as far as Tier 5. 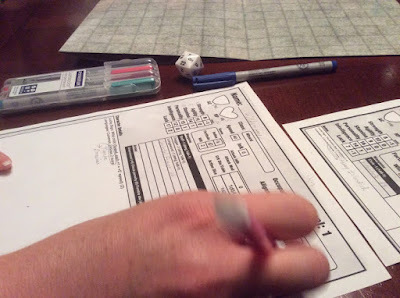 The campaign concluded following a nightmarish romp through my Cypher System conversion of the classic Ravenloft adventure, resulting in the death of two characters. 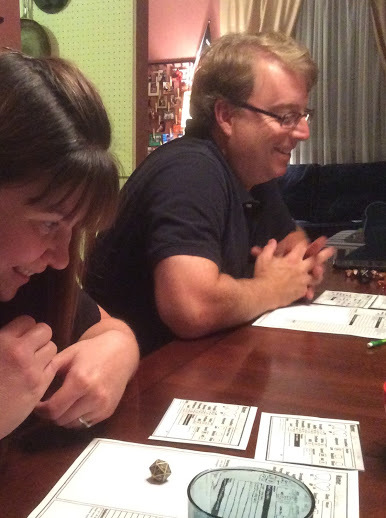 My other regular campaign was a monthly game of The Strange with my wife Jennifer and some local friends. 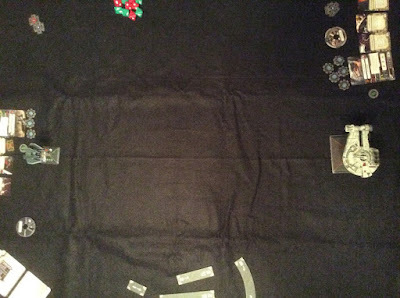 Our Sherlock Holmes/Dark Sun/Star Wars mash-up ended in legendary fashion, and one of the players recently moved which puts the future a little up in the air. … and I’m completely stumped on what to play next! Regular readers of my blog may "call shenanigans" on that last comment, as I’m still gaming fairly regularly. 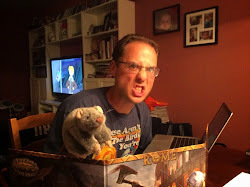 Over the last two months I’ve played Savage Worlds (Weird Wars Rome and 50 Fathoms), Dungeon Crawl Classics, and Basic Fantasy RPG, with lots of different people. But for the most part these have been one-shots or mini-campaigns. I will admit that Viking Crawl Classics has some staying power, so you can expect to see another session of that in the near future. What’s going to be the next great campaign? I certainly have some terrific options to choose from. In recent months I’ve picked up some incredible games and campaign settings, from Star Wars: Edge of the Empire to East Texas University. But there are also quite a few other games on my shelves just begging to be played, and I would feel terribly responsible if I didn’t give them some face time. To compound the issues, I’ve got this weird brain that cooks up some outrageous mash-ups. I’ve learned this past year that I really enjoy running games that go completely off the rails, and so that may be a theme for future games. For those of you who are fans of Monte Cook Games’ The Strange, Ardeyn should be very familiar. In The Strange, Ardeyn is a recursion (think “other dimension”) based on a fictional MMORPG. The MMO just happened to be called "Ardeyn: Land of the Curse." Ardeyn operates according to the laws of magic, and characters traveling to that recursion experience many traditional fantasy trappings. Interesting races, enchanted swords, dark spells, all that – and more – exists on Ardeyn. In a typical game of The Strange, players characters may travel to Ardeyn for a period of time before returning to Earth, Ruk, or another recursion. Daring player characters investigating ruins, taking on tyrants, and felling horrible beasts while collecting loot and lore in the pursuit of glory! Along the way, however, hints of other “worlds” could possibly appear, along with threats, allies, and potential intrigue. To further reinforce that Ardeyn – Land of the Curse is something different from a standard campaign in The Strange, I would use the Cypher System Rulebook for the types: Warrior, Adept, Explorer, and Speaker. Vector, Spinner, and Paradox, the types featured in The Strange core book, are all designed to interact with multiple recursions and the dark energy network itself. By using the new types from the CSR, the players would be rooted in Ardeyn as its own solitary world. This is not to say that I wouldn't draw The Strange corebook and all of its supplements. I would still need Ardeyn-themed descriptors, foci, cyphers, and artifacts for the campaign. The newly released Worlds Numberless and Strange also has an extended chapter giving more detail to Ardeyn. To satisfy my old school obsession I’m considering digging into some of my old Dark Sun adventures for plots and ideas, given the Sumerian/Egyptian “sword and sandal” feel I get from Ardeyn. In addition, as the game evolved, I would bring in many of the concepts straight out of Ryan Chaddock Games' Broken Immersion. This supplement explores all of the interesting features that should exist in a world based on an unfinished (a.k.a. "un-patched") MMORPG. 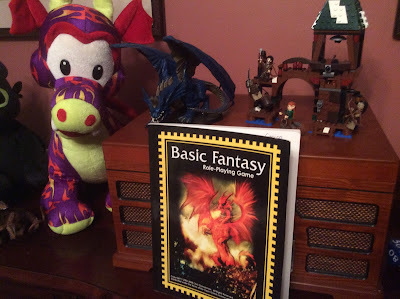 A campaign of this type would let me scratch my current "fantasy itch", while keeping me rooted in my ongoing love for the Cypher System, without having to create a new campaign setting from scratch. … so what if I ran both at the same time? That’s the concept behind Rimward Orion Academy. The players would be students at a JumpCorp sponsored, space-based university trying to deal with alien threats while passing some incredibly difficult courses that require plenty of field work on hostile worlds. In space, no one can hear you scream… because you just flunked Dr. Spax’s Plutonian Renaissance course. Players would not only have to choose their species, but also their major. Maybe they will build a Aurax Theoretical Liberal Arts Major, or perhaps a local Construct Townie. Adventures could come from either the ETU or Last Parsec sourcebooks. As the player characters advance from freshman to senior, they would eventually catch the watchful eye of JumpCorp recruiters. … no matter what corner of the galaxy the characters have to explore during their work-study. I think this kind of campaign could end up being upbeat, fun, and campy while still leaving room for intrigue and adventure. I'm not sure how I would use any of the awesome plot point campaigns from ETU or The Last Parsec in Rimward Orion Academy. But with the random adventure generators of ETU run through a science fiction wash, this could be a blast at the table session after session! … so gooooo Rimward Orion Academy Bloodwings!!! So there is this little local gathering called Gen Con 2015 next week, and that could definitely throw a big wrench in the cogs of my twisted mind. You may have seen my Gen Con Wishlist a few posts back, and any one of those games could lead me to something totally out of left field. Perhaps it would be Dragon Age, or maybe a certain Purple Planet. Anything is possible after a week of gaming glory! I'm well known to be a bit mercurial when it comes to campaign setting selection, so don't be surprised if I do a complete one-eighty. Now I open this up to all of you. I would certainly appreciate any thoughts or suggestions. If you are one of my current players, and one of these strikes your fancy I would love your feedback. If you missed my first post featuring Dungeon Crawl Classics RPG, TSR's Vikings Campaign Sourcebook, and this very adventure, it may be best to read it first. Last night's game almost didn't happen, but I'm so glad that it did. We were short one player, Andy, who had car trouble, and three were running late. But it work doug. Although we wouldn't have enough time to finish my on-the-fly hack of Randy Maxwell's Isle of the Abbey (from Dungeon Magazine Issue #34), at least we could run through my favorite scene. One of my favorite movie is Inglourious Basterds, a World War 2 revenge flick by Quentin Tarantino. When I read through Isle of the Abbey recently I realized that the scene where the party had to enter the depths of the ruin would bring about all the worst parts of "fightin' in a basement." With the guards and soldiers of the Abbey ready for the raiders, and the Vikings lacking any other way into the subterranean ruin, this first battle of the night could play out like an ugly Mexican standoff. Clearly someone, or something, was living in the ruined basement of the shattered monastery. From the top of the stone staircase Frelger could make out at least two burning sconces on the wall, lighting up a great open chamber. Moving silently and with extreme caution, the viking thief carefully descended the staircase. At the bottom, Frelger saw eight heavily armed humans ready for battle. Four of the humans wore holy symbols of an unknown deity, and three were guards with javelins and short swords. At the edge of the room a tall, powerful warrior clutching a longsword whispered to his men. "They're coming, be ready," he muttered. Spend a few more minutes thinking up a better option than #1. The plan would be to push the giant spider's dead body down the staircase as a "distraction", and then draw swords, and run screaming down the stairs. The tumbling dead monstrosity certainly confused two of the guards, who threw their javelins at the corpse. The rest of the humans were not impressed. Still, Calder was the first into the room, battle axe swinging and followed by a team of lightly armed attendants. From the staircase, Rolo asked Thor for a blessing of Darkness, engulfing a full quarter of the room in shadow, and Hildenoore popped off some flaming hands. The viking raiders were fairing well against the guards and clerics, cutting their way through their weak ranks without suffering a single loss. But then Ogmund the Strong emerged from the darkness! The cleric at his side attempted to "bless" him but the dark gods were not listening. That's alright… Ogmund didn't need the gods! He chucked a burning molotov cocktail at the steps, and missed. Instead of setting Rolo and Hildenoore aflame, Ulf and the team's goat turned into a pair of crispy critters. Ogmund's hot cocktails weren't his only weapons, for he also carried a longsword. Smid was the first to fall to Ogmund's heavy blad, but Helgu soon followed. It would take the entire team's combined effort to take down the chainmail clad human-giant. The final blow would come from Rolo the Cleric. With a mighty swing, the fierce priest of Thor cut off Ogmund the Strong's head… with… with a hammer. Once the last of the guards and clerics fell, the team of vikings spent a few minutes stripping their bodies of useful weapons and armor. Since most of the attendants were clad in rags, using pitchforks, scissors, and human femurs as weapons, some short swords and chain mail were serious upgrades! After outfitting themselves, the vikings began investigating the room. During some of the lackluster investigating, the party came across a chamber that had once been an armory. There were empty racks, bins, shelves, and a single armed Elf clutching a rune-covered shield. "Death to the heathens!" screamed the Elf, as he charged Illugi with the shield. With a single smash, the shield broke all of the attendant's ribs killing him instantly while burning the runes into his flesh. The Elf didn't stand for too long, not with a half dozen vikings cutting away. "Bayleaf" would've been proud of his enchanted shield, however. When Calder picked it up it burned something wicked. Hildenoore couldn't make out the runes, but Yrsa the Elf thought they were some kind of ancient elvish. The Elven Chandler winced as she picked up the shield, and miraculously she didn't die! [The Shield of the Emerald-Folk was not in the original adventure, but was something I threw in to add some DCC-feels. Magical items in DCCRPG are supposed to be rare and powerful, but in Isle of the Abbey they are all over the place. Bayleaf was supposed to have a magic shield +1 and Elven Boots. Nope… not in my game. The Shield of the Emerald-Folk acts as both a magic weapon and magic piece of armor. The Shield provides a +2 armor bonus (rather than a +1 bonus for a regular shield), so long as it is held. When used as a weapon, the Shield can be used as a +2 weapon, causing 1d3+2 damage with a successful hit. Any non-elf to pick up the shield suffers 1d6 points of damage from an ancient curse. The Shield of the Emerald-Folk does not provide the armor bonus when held against another elf. The Shield cannot be used to strike an elf. The final room the party searched was some kind of meditation chamber. Full of weird tapestries, and thick black velvets, there were murals and stone tablets strewn about. A small stone table acted as an alter, and on top was a heavy iron brazier. Rolo searched the room and pulled back the curtains, revealing an ornate hidden door to the south. But before the party could open the portal, a voice called from the central chamber. Ozymandias and Odium were standing at the base of the stairs. Ozymandias was a high priest of the dark gods and Odium a demonic warlock. Both were angry that they had to deal with a pack of raving vikings. With an evil smile Ozymandias revealed to the raiders that they were now trapped on the island and should surrender. The viking longship now burned on the coast. 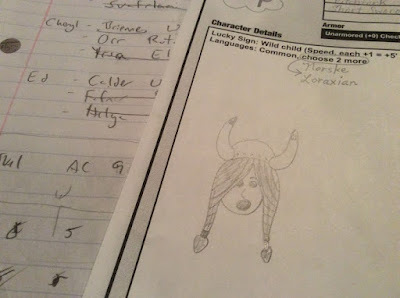 Before the cleric could finish his monologue Yrsa charged with the Shield of the Emerald-Folk! The shield struck a mighty blow, but Yrsa soon found herself on fire. The warlock was a master of devil's flame, and his scorching blast turned the elven chandler into a lifeless husk in mere seconds. Gauti moved in with a pitchfork but was also incinerated! Even though the odds were in the seven remaining vikings' favor, these two spell casters were quite powerful [Level 3 Cleric and a Level 3 Wizard]. Strike after strike, hammer versus sword, the dark cleric and his hideous sage slowly lost the edge in battle. The warlock Odium would suffer a fatal "leg sweep" from Calder. Ozymandias survived for another round, but ended up with a crushed skull from Orr the Rutabaga Farmer. As the dark cleric died, he groaned his last words. "Unworthy," he gasped. "You are all unworthy of the secret treasures that lay in the bowels of this place." 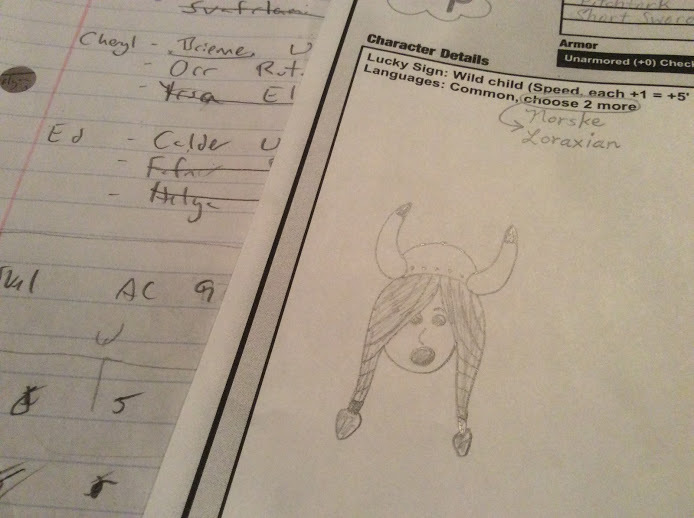 Jen the artist depicts Hildenoore the Viking Wizard. Ulf - Set ablaze by a rogue molotov cocktail. Smid - Cut down by Ogmund the Strong. Illugi - Smashed by a rune-carved elven shield. Yrsa - Left a smoldering pile of charred elf by the Warlock. Gauti - Lit up by a Warlock's scorching ray. X-Wing Flight Report 9 - Evie's Birthday Blast! Tonight marked my daughter Evie's 9th birthday. To celebrate, after she opened her presents and had cake, the birthday girl requested a special one-on-one dogfight between her favorite TIE, and whatever the Rebel Alliance could scrounge up on such short notice. Since it was getting late (we were well past 9pm when we started), I cautioned against any kind of major space-battle. 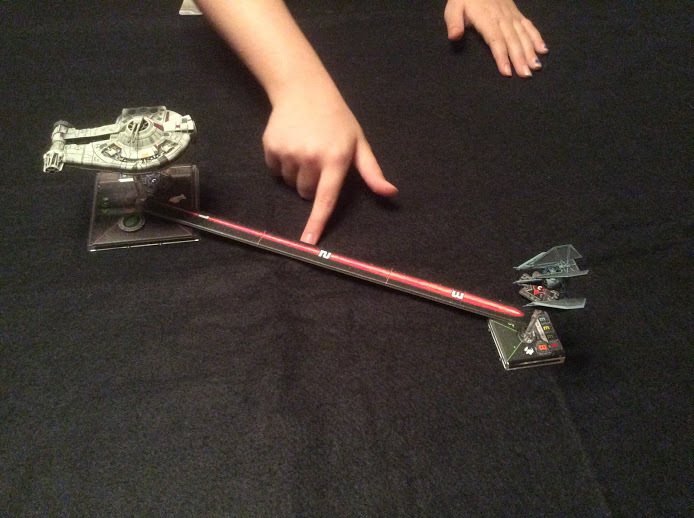 We agreed that the match should be simple, but Evie's idea of an easy battle included the TIE Defender, a 35+ point, shielded TIE monstrosity! 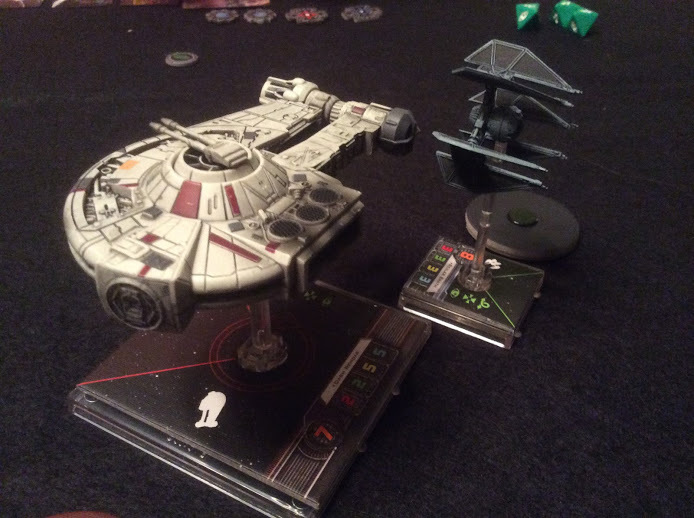 After a few upgrades, her ship was right at 50 points! To make this a true rematch, after the walloping my YT-2400 took last month, I went with Dash Rendar. 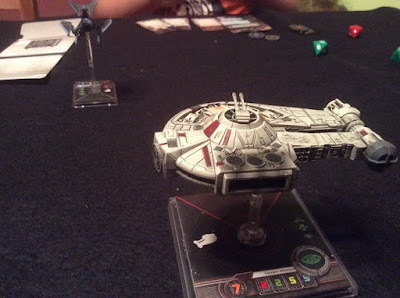 This match really became a true breakdown of our X-Wing Miniatures Game experience thus far: Evie's favorite fighter against my favorite ship. The YT-2400 has long been my favorite vessel in the Star Wars universe, ever since reading Shadows of the Empire back when I was younger. But after a long, long losing streak, could I pull off a birthday upset? 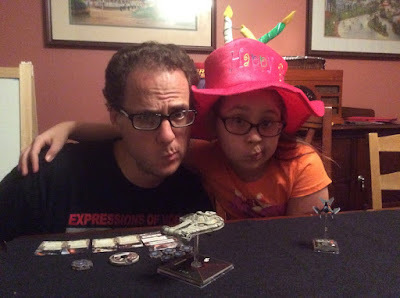 Did I have it in my heart to put it all on the line and try to shoot down my dear daughter's favorite fighter on her birthday? A 50 point epic one-on-one dogfight between my favorite ship and Evie's favorite ship! 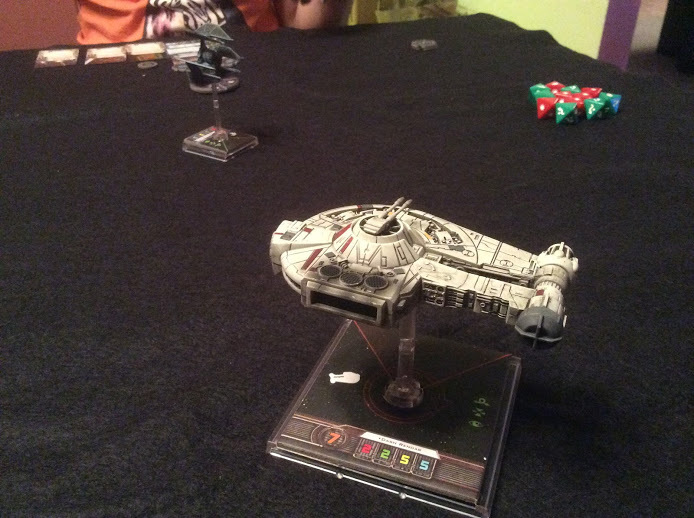 I'm no expert at X-Wing, having only played it casually with the kiddos and a few friends, but I'd say the maneuverabilities of the TIE-Defender and YT-2400 are evenly matched. 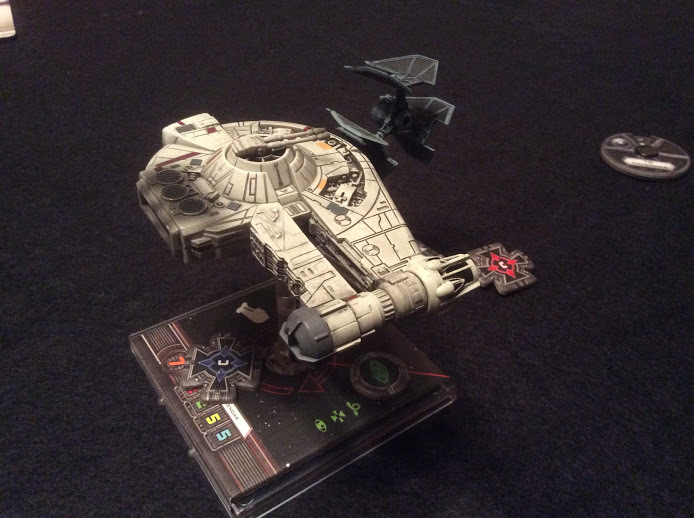 The TIE Defender is capable of a crazy "white" speed 4 K-Turn, which is somewhat of an advantage. This battle really came down to whether or not the YT-2400's durability could stand up against the TIE Defender's menacing array of weapons. Sadly, unlike last game, my dad and his awesome camera were not available for a high-class photo shoot. So you're stuck with my iPad's camera. Sorry. 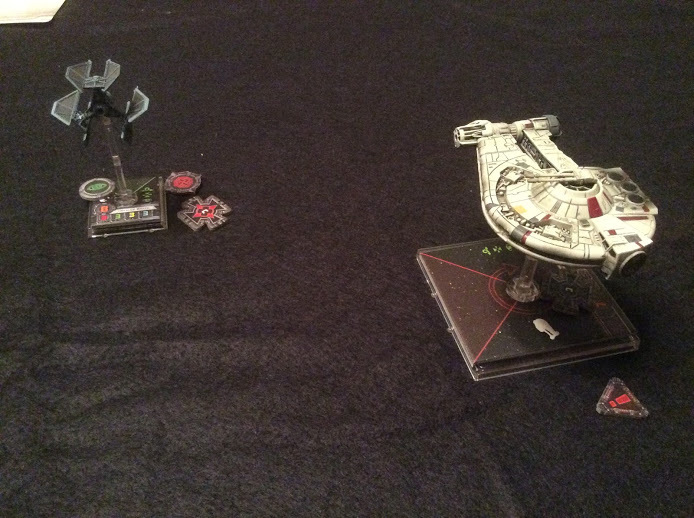 Simple start, both of our ships on either side of the table. Still too far away to shoot at each other, after the first round we both realized that this was going to be interesting. On Turn 2 Evie flew straight and I sidled right up along side and blasted away. Managed to knock out a shield with my turret on the first shot! My tactic for the entire game quickly became "dart in and shoot, and then fly away". Evie had a hard time dealing with my firing arc. Evie and I traded fire on Turn 4, and I lost a shield. 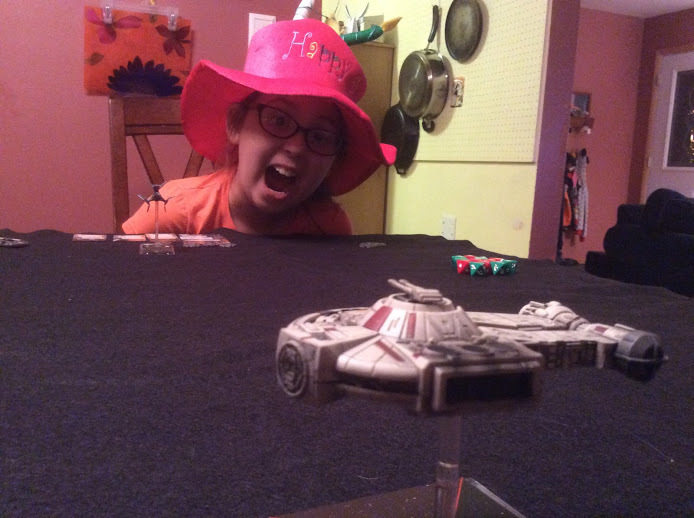 She used her Heavy Laser Cannons to drop 4 attack dice on Dash at a distance! My plan was finally complete! Turn 5 had Evie right in front of my ship, but outside of her firing arc. 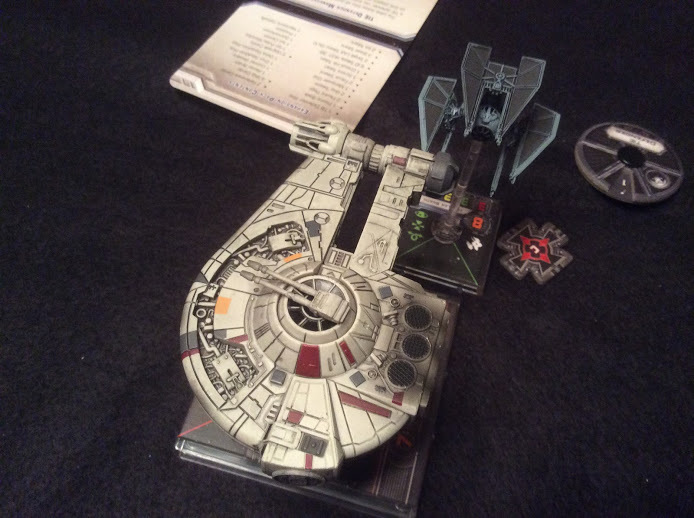 So I opted to use my Ion Cannon… which worked oh, so well! 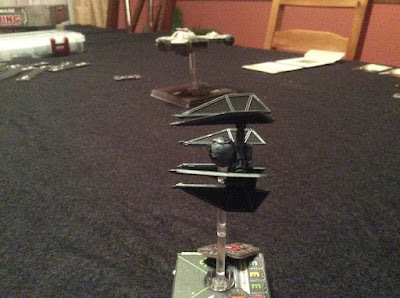 After an immediate K-Turn, I unsuccessfully lobbed a homing missile at Evie's ionized TIE Defender. Turn 7 was rather boring, but Turn 8 had what could've been an exciting "head-to-head"… but nothing really came of the exchange. … and then Evie's TIE Defender ended up right on my flank! 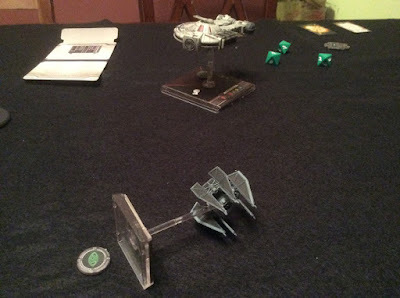 A very successful strafing knocked out the rest of my shields! I'd have to play the rest of this game very carefully. 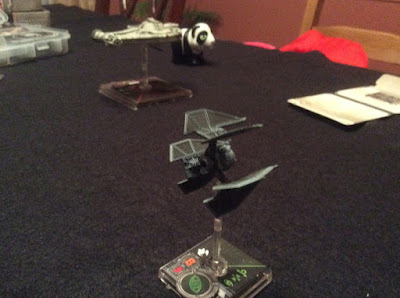 So I flew off again, and then turned around, not too far from a space panda. 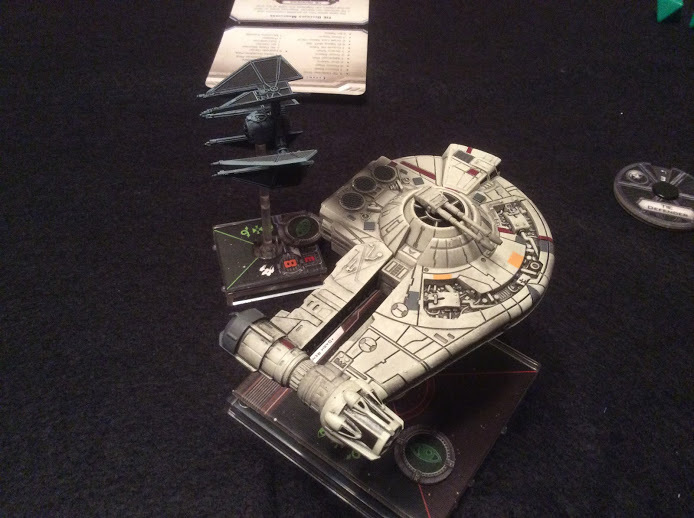 … and on Turn 12 I finished her off. Way to go Dash! Oh, I'm a terrible father! There was actually a big change to our gameplay that I failed to mention earlier. Up until now, we had been using the Focus action wrong. Whenever we used Focus, we flipped "all" of our focus tokens over, not just one. My friend Ray corrected me after watching our X-Wing Actual Play video a few weeks ago. This really threw Evie's game off. Previously she would almost always Focus, because the benefits were so incredibly good. Honestly it bewildered me a bit as well, but I just figured it a quirk of the game. We both still had a great time, and are looking forward to checking out a local X-Wing Tournament this Saturday at Mr. Nice Guy Games in Monroeville. We won't be playing, but we hope to watch a few other gamers in action! All four were generated randomly, using 3d6 in order for ability scores. Elfaretta and Munsterr were created during our Dungeons and Terraria video. Since I knew Carrie would be gunning for us, I gave everyone maximum hit points. You saw that it didn't really help! Equipment: Mace, 2 spears, dagger, backpack, leather armor, 6 torches, tinderbox, waterskin, shield, 12 gp. Identical to normal goblins, but they get a 1d4 damage steel fist punch that causes lethal damage. Instead of giving 10 experience points they give 20!